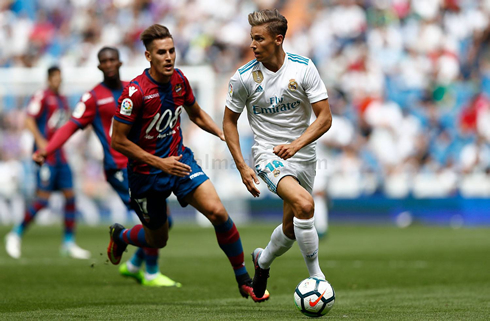 Real Madrid lost another 2 points in La Liga in disappointing fashion, this time after conceding a 1-1 home draw against Levante. Zinedine Zidane decide to rotate multiple players in his starting lineup and it ended up costing him 2 points. Zidane's changed side gave many of the younger players opportunities, something we're all happy to see. However, after this result may call into question some of the Frenchman's lax squad selection, though the players on the pitch were certainly good enough to win the match. Real Madrid never seemed to be in full flight today, as their play in the final third was quite poor. 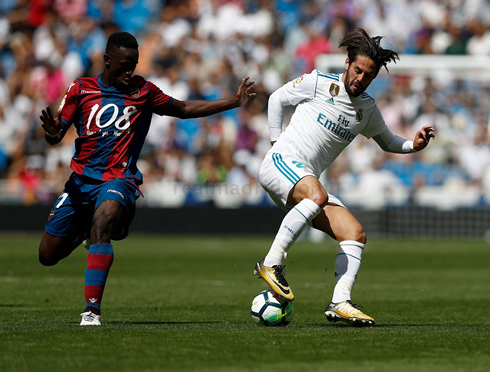 Levante scored early after a mix-up at the back from Dani Carvajal, who has been quite off his usual standard to start the season honestly. Ivi Lopez was there on hand to finish, as the promoted side took a shock lead inside the opening 15 minutes at the Bernabéu. Madrid kicked it into a higher gear, but the sun may have been the only thing shining at the Bernabéu early on, as chance after chance was wasted. Karim Benzema completed a series of unfortunate touches before going off with an injury, leaving Madrid with only Borja Mayoral (who didn't even make the bench today) as the only recognized striker in the entire squad. Gareth Bale was brought on and while he was lively he couldn't finish off a few of these clear chances. The second half became more frustrating, as Raul in goal for Levante kept Real Madrid at bay. When it wasn't the Levante keeper making great saves in the box, it was the Madrid frontline repeatedly making the wrong decision in the final third. Sloppy under hit passes were a consistent theme and Madrid kept possession but did nothing worthwhile with it. 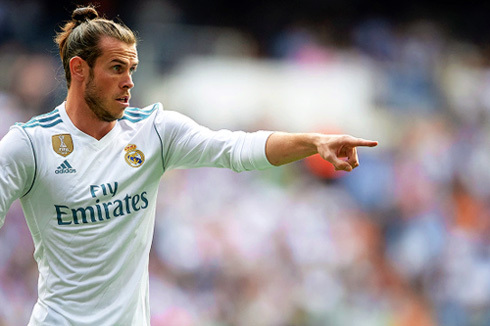 Gareth Bale would find himself with headers inside the six-yard box on a few occasions, but he couldn't hit the target at all. The worst of them being a chance in the 87th minute that went agonizingly wide. And it would get worse as Marcelo was sent off for kicking out in the last minute of the match, meaning we'll be without him for the next league fixture against Real Sociedad. Toni Kroos hit a late shot off the post as well, but there would be no heroics like last season as Real Madrid have now dropped 4 points in the last two games. Some need for concern, but not really a time to panic. Real Madrid drew three games in a row last season as well in September, so all is not lost yet. Up next, a return to the Champions League, where they'll host Apoel Nicosia and we'll see the brief return of Cristiano Ronaldo, who I'm sure will be eager to hit the pitch. Cristiano Ronaldo next game is for Real Madrid on September 13 of 2017 against APOEL Nicosia. You can watch Juventus live stream, Real Madrid vs APOEL Nicosia, Barcelona vs Espanyol, Swansea City vs Newcastle United, Burnley vs Crystal Palace, and Schalke 04 vs VfB Stuttgart, all matches provided from our soccer live game pages.